Rotary club is an International organization for youths of the age group 18-30 years is steadfast with a desire to bring about a change in the society by inculcating in the youth the attitude of selfless service and making them aware of the social issues which are treated with indifference by many. Rotaract is a Rotary-sponsored service club. ROTARACT is ‘ROTARy-in-ACTion’. It has evolved quickly in its short but dynamic history. In the early 1960s Rotary club around the world began to sponsor university youth groups as community service projects. 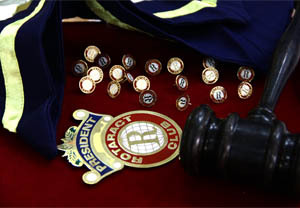 The 1967 – 68 RI president, Luther H. Hodges, and the RI Board of Directors considered this club activity to have international relevance, and Rotaract was approved in 1968 as an official program for Rotary clubs. Several decades later, the Rotaract program has grown into a strong, international network of 7,300 clubs in more than 150 countries and geographical areas and our Rotaract club of KLNCE is one among them. District Assembly On August 2013, at District assembly held at Trichy, our club was awarded 5 awards. Our hardwork and dedication has finally paid off on hearing these awards and honor. This achievement is because of the effort of all rotaractors and the full support from our Club Coordinator Mr.N.P.Krishnan ASP/Chem and Principal and Club Advisor Dr.A.V.Ram Prasad. 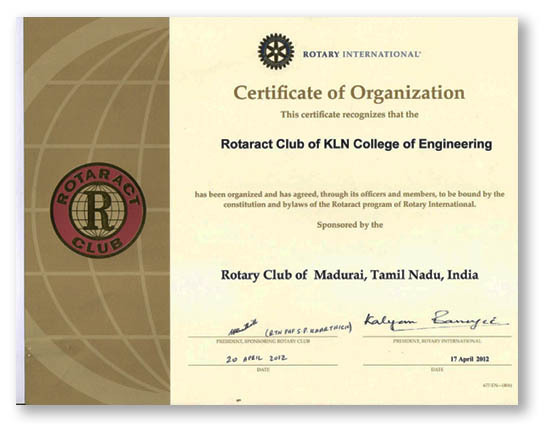 Our Rotaract club of KLNCE proceedings include Donation of 3 bicycles and 4 sewing machine to the needy people on the occasion of our 20th College Annual day held on 12-4-2014. To encourage and cheer up the fresher’s of our college our club organised “ROTAFEST’14” for Budding Engineers to enhance their soft skills and develop their creativity. As a part of this event, Quiz was conducted on 17th March 2014, where 149 students participated and among them 50 of them were shortlisted for further rounds. On 18th March 2014, Situation Handling and Multi-tasking events were conducted. Students participated enthusiastically and won many prizes. Also gave us feedback and valuable suggestions for carrying over the same in the upcoming years. The mission of the Camila Children's Cancer Fund is to conquer cancer by providing outstanding emotional and financial support to the children and families. Our contribution to their mission was that we collected a total amount of Rs.43,080 from our college students and staffs, as a donation to the cancer children. Also 22 rotaractors participated in the dance marathon, a fund Rs.43,080 /- collecting event held on 22nd February 2014 to create awareness among the public. 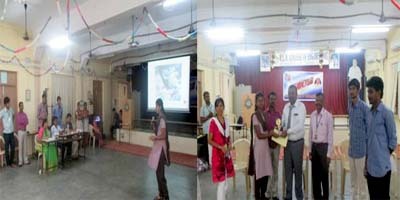 17 Rotary clubs around Madurai joined hands together in conducting 'Mazhalaigal', the Child Welfare program, on 15th and 16th of February, 2014. 30 Rotaractors from our club volunteered and Children from various schools in and around Madurai gathered in Tamukkam Ground. Madurai District Collector, Mr. L. Subramanian honoured the event, with his motivational speech. Also Stationery items like bags and geometry boxes were offered to children as a part of this program. Rotaract district conference RODI'CON-14 , was organized by Rotaract Club of Tiruchirapalli Centenary on 8th and 9th of February 2014 at Hotel Golden Parks Inn, Kodaikanal. There were various sessions, surprise events and cultural programs in which a number of 6 students actively participated. It also served as a great opportunity for our Rotaractors to interact with other Rotaractors of other clubs. To increase awareness of the fact that hospitals are very often in dire need for blood, Rotaract Club of K.L.N. College of Engineering organized BLOOD DONATION CAMP on 4th February 2014. 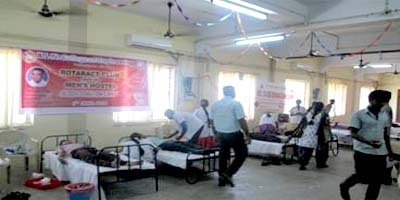 211 units of blood were donated with the help of Meenakshi Mission Hospital, Madurai. As a part of continuing our service activity, we joined hands with Vasan Eye Care and Conducted Free Eye Screening Check up on January 28th 2014. As our first session, camp was conducted for school children at Pottapalayam Govt. School. A Crew of 8 members including Doctors, Refractionist, Optical Specialist and Staffs were present. 120 Students 30 villagers were benefited out of it. Our second session was held at K.L.N college campus where 700 students and 50 numbers of Staffs attended and got benefited. This camp was honoured by the presence of Our Executive officer (PR & Stat.) Mr.K.S.Renga Rao. Rotary club of Dindigul Queencity and PSNA college of Engineering and Technology, conducted Skill Scaler, a talent search for Engineering College students on 25th January. The programme proved to be a platform for professional skill development. Events like Group discussion, Interview, Situation Handling & Marketing were organized. 4 Rotaractors from our club participated and got benefited . On January 5, 2014 'Umaang, the District fellowship meet', was conducted by Rotaract club of PSNA College of Engineering and Technology. This fellowship meet brought about many Rotaractors in and around the District in one shell, to participate in various events like Dance, Singing, Instrumental, Comedy, Fun audio, Tamil speech, Quiz. 12 Rotaractors from our club participated and emerged as Overall Runners-Up. Rotary Youth Leadership Awards (RYLA) intent is to encourage students to be more effective servant leaders. The result is that these students return to their schools/ colleges and communities motivated to take on additional leadership roles and to find additional ways to serve. RYLA Rajagopal - 2014 organised by Rotary Club of Madurai West at Mahatma Residential School, Alagar Kovil on 3rd, 4th and 5th of January 2014, where 3 rotaractors from our club attended and came with flying colors. This was held in many government & private schools such as Madurai Meenakshi Matric School , Balamiddle school, Crown Matriculation school , MC Hr.sec school, Fatima Matriculation school on 27th and 28th of November. Around 200 students were benefited.. The Installation ceremony is a Function that is held every year in order to assign the posts, the office bearers and declare the leadership of the upcoming PRESIDENT. This Ceremony was held to Great Success on 8th October 2013 at Indoor Stadium. It was attended and honoured by Rtn.S.Chidambaram, President, Rtn.Rajan Chedda, Secretary Rotary Club of Madurai and Rtn. Past President. K.R.RajaGovindasamy, Rotary club of Madurai West. Our college stood first among all the Engineering colleges by donating more units of blood every year. This year also continued to hold the pride of place.On 14th of September, we had organized a Blood Donation Camp in our college along with Meenakshi mission hospital .The Rotaractors served as volunteers for the camp in which our college students donated blood and hence we are rewarded for having donated maximum units of blood (379 units) at Meenakshi Mission Hospital in 1st October 2013. Paadum paravaigal, a musical extra-vaganza hosted by Rotary club of Sivakasi on 28-09 -2013. This event was designed to identify and award outstanding musical ensembles and soloists. Our Rotaractor Gayathri, Second year ECE department, won the first prize bringing laurels to our club. On 5th April 2013, along with Our College 19th Annual Day celebration, Rotaract club of KLNCE had contributed Three Sewing machines for a Clerk, Lab assistant & Driver which costed around Rs.17, 000. A crew of 16 Rotaractors accompanied by Our Staff Coordinator Mr.N.P.Krishnan,Associate Professor / Chemistry and Professor R.V.Suresh Babu, Automobile attended the XXII Rotaract district conference held at Yercaud on 16th-17th February, 2013 which was hosted by Rotaract club of Karur. Akhil Bharathiya Terapanth Yuvak Parishad in association with Rotaract Club,Red Ribbon Club, and NSS of K.L.N. 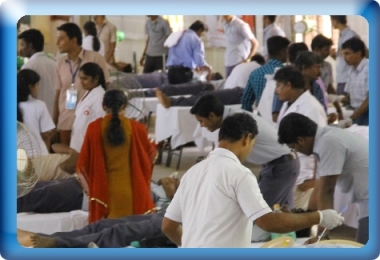 College of Engineering organized MEGA BLOOD DONATION CAMP on 17th September 2012. The camp turned out to be successful with 436 number of donors and more than 400 units were donated with the help of Meenakshi Mission Hospital, Madurai. Rotaract Club of K.L.N. College of Engineering hosted BRASSTACKS ’12, Leadership training seminar for college students under the Leadership of Rtr. K. Vishnu Shankar, Chairman of Brasstacks’12 and Rtr.C.G.Saravanan, Secretary of Brasstacks’12 on 22nd September 2012. The event was inaugurated by the leading Urologist Dr.V.Ravindranath and was honored by Rtn.N.S.Srirenganathan, District Rotaract Committee Chairman, Rtr.R.Muthukumaran, District Rotaract Representative and Rtr.R. Saran Kumar, Zonal Rotaract Representataive-Zone1 The Club had conducted various events such as “Lead the world” by Rtn.P. Samson, Principal of IRRS, “Mind your mind” by Rtn.P. Mohamed Nazer, President Rotary club of Madurai North and “Build your team” by Mr.S.A. Arun Kumar, Resource Person VIPL. The Club had conducted various events such as “Lead the world” by Rtn.P. Samson, Principal of IRRS, “Mind your mind” by Rtn.P. Mohamed Nazer, President Rotary club of Madurai North and “Build your team” by Mr.S.A. Arun Kumar, Resource Person VIPL. The Rotary Club of Madurai celebrated Platinum Jubilee on December 22nd and 23rd 2012. 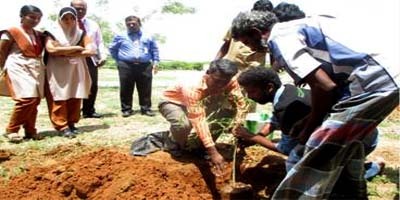 As we are a part of child club of Rotary Club of Madurai, a crew of 27 members from our club volunteered the function. We came aware of the history of rotary, about past presidents, active members and their services and future projects to be carried out by them. The chief Guest for the meeting was addressed the gathering, after which interesting video clips of members were shown as a part of celebration. As Nurturing is one of the Prominent feature of IDYE, focuses on providing knowledge about different cultures, induces the Rotaracters to respect various cultures through sending them to visit other Rotaract Districts (Outgoing IDYE) and by hosting Rotaractors of other Rotaract Districts (Incoming IDYE). Our Club 2012-2013 President Rtr.N.Karnamurthy attended an outgoing IDYE which was held at Surat (RI 3060), Gujarat from 14th to 28th January 2013. Our Club Rotaractors Balamurugan & Alaguraja attended an outgoing IDYE which was held at Bangalore on March 2013. Our incoming IDYE was from Bangalore with Four Rotaracters. They were hosted by Rotaract Club of K.L.N. 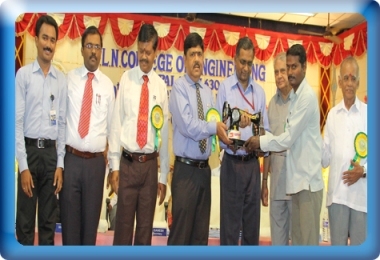 College of Engineering and supported by Rotary Club of Madurai for Two days on February 2013. A team of 20 Rotaractors represented our college Rotaract club at RODIFIER’12, Rotaract District Cultural Festival hosted by Rotaract Club of Holy Cross College (Autonomous), Tiruchirappalli on 8th December 2012. Our members won the Second prize in the Dance Competition. A District Forum was organized by Rotaract Club of Madurai Pandiyan at Gandhi Museum on 1st September 2012. From Rotaract Club of K.L.N. College of Engineering 25 Rotaractors and Staff Co–ordinator Mr.N.P.Krishnan , Associate Professor / Chemistry made their presence. Rotaract Club of K.L.N. College of Engineering joined hands with Vasan Eye Care and Conducted Free Eye Screening Check up on 2nd and 3rd August 2012. A Crew on 9 members including Doctors, Refractionist, Optical Specialist and Staffs were present. 440 numbers of Students and 61 numbers of Staffs attended and got benefited.This camp was honoured by the presence of Our Principal. 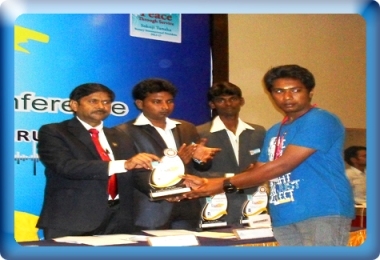 A team of 4 students accompanied by our Rotaract coordinator attended “SKILL SCALER 2011” on 24-09-2011 sponsored by Rotaract Club of Dindigul Queencity and PSNA College of Engg & Tech. Skill Scaler was a good platform for professional students to enhance their skills on placement and we bagged up second place in Group Discussion. Five rotaracters attended the Rotaract Youth Leadership Award (RYLA) camp for 3 days held at Mahatma Residential School from 06-01-2012 to 08-01-2012. The rotaracters were engaged in various events and bagged up many prizes. A group of 12 rotaracters under the guidance of Mr.N.P.Krishnan ASP /Chemistry & Rotaract Club Coordinator attended the District Zonal Forum VI –MITRA ’12 at YMCA Hall on 11-2-2012 hosted by SACS MAVMM College of Engg. We were instructed about the proceedings of a Rotaract club and its activities. As a part of our Rotaract club activities and to encourage the talents of the students various events were conducted on 4-4-2012. Events like drawing, extempore and solo singing was conducted. We were happy by the great response given by the students. 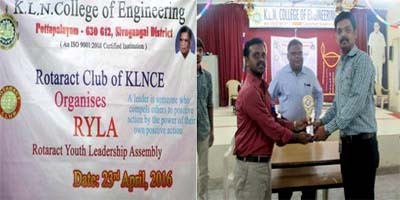 As an initiation of our Rotaract club KLNCE the installation ceremony was organized on 9-4-2012 which was presided by our college secretary Shri S.V.S. Shivnath and Mr. J.Y.Manoj Kumar was recognized as the President and Miss.B.Radha was recognized as the Secretary and other executive members were also badged for the rotary year 2011 – 2012. 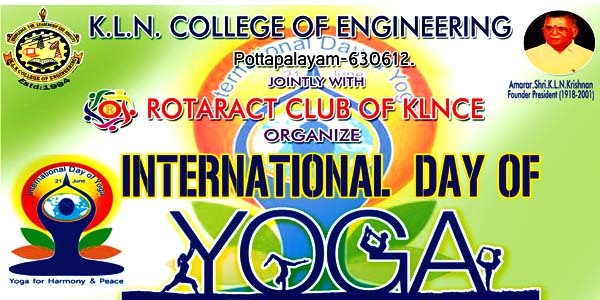 This day strengthened the communication between our college club and our parent club Rotary Club of Madurai. On 9th Nov 2012, the Second Installation of Rotaract Club of K.L.N.College of Engineering was held at Indoor Stadium. This event saw the presence of the President of Rotary club, Madurai Rtn. Subramaniam, Secretary, Treasurer and others of the same club. The acting President of Rotaract Club of KLNCE Rtr. 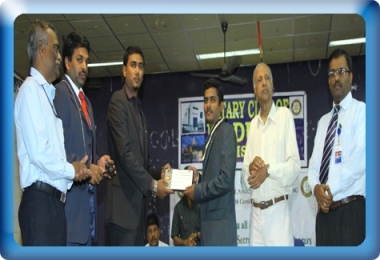 Manoj Kumar honored the President elect for the year 2012-2013, Rtr. N. Karnamurty and acting Secretary of Rotaract Club of KLNCE Rtr.B .Radha honored the Secretary elect for the year, Rtr. 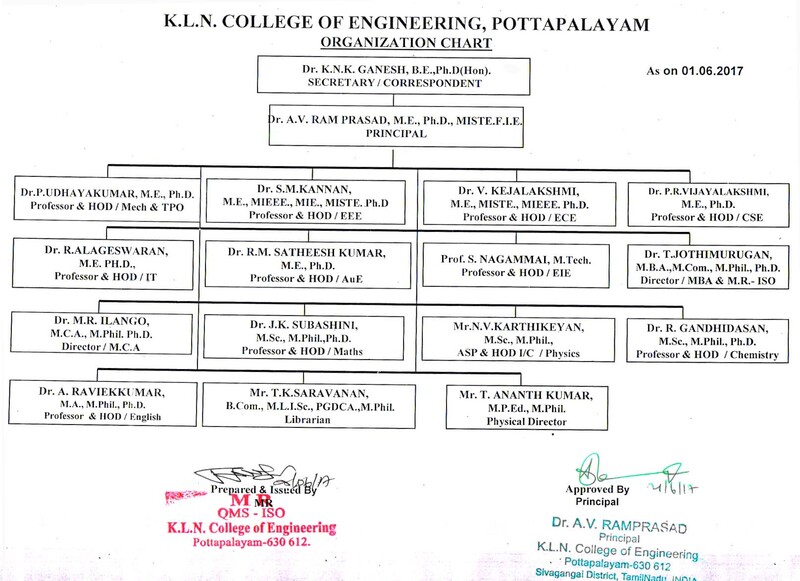 M. Pradeepa, followed by the installation of other office bearers. Sponsored by the Rotary Club of Madurai. This club aims at the self-development of students through educational seminars, Quiz programmes and constructive activities for the benefit of the society. NSS Units (I, II & III), Rotaract Club and Youth red cross of K.L.N. College of Engineering, Pottapalayam organized a Blood Donation Camp on 22.01.2011 and it was presided by Dr. S. Ganapathy, Principal. NSS Program Officers, Rotaract club Staff Co-ordinator Mr.P.S. Kumaresh / ECE and Mr. A. Ravi Kumar AP/ English organized this camp. Dr. Prabha Samiraj from Government Rajaji Hospital Madurai and their team together conducted this Blood Donation Camp. Both male and female students along with the staff members donated blood in these blood units of 146. Rotaract students extended their support for successful conduct of this Blood Donation Camp. Rotaract club of K.L.N.College of Engineering organized one day program at RETREAT Home, Pulluthu for the mentally challenged people residing in that place on 14.09.2010 tuesday. The Rotaract Club Klnce sponsored bedsheets and Lunch provided to the mentally challenged people in the RETREAT. Dr. A.V.Ramprasad HOD/ECE participated on behalf of the K.L.N. COLLEGE of engineering, Rtn. P.S.Kumaresh , Rotaract club Staff Co-ordinator Organised, Dr. Padmini, Phsychiatrist presided the function. Rtn. Akram Essa student – Rotaract Student President and rotaract members of the K.L.N. College of Engg. Participated and serviced the mentally challenged people. Dr. Padmini talked about how to handle mentally challenged people. Mentally challenged People did cultural events. Dr. A.V.Ramprasad distributed the bedsheets. Sri Ramachandra Eye Hospital, Madurai. 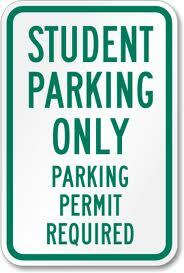 The Principal Dr. S.Ganapathy, the vice Principal Dr. L.V. Mohan of KLNCE presided over the function. The Rotaract Club Co-ordinator Mr. P.S. Kumaresh-SL/ECE gave the welcome address, All the Deans, HODs, Professors, Assistant Professors, Placement Officer and all the staff members participated in the program. Rotract club student secretary K.G.Muthu Kisor gave vote of thanks. The Co-sponsor Susee Opticals, Madurai provided concession for all who those have attended the camp and provided free spectacles for non-teaching staff members. More than 200 staff got benefited by this free eye check up camp ENVISION-09.